There’s good news for Mom and Pop corner stores, auto repair shops and your neighborhood taqueria. More loan options are available for small businesses than most realize. Accion's Amy Clinton, left, and New Market Support Company's Kelsey Hamory explained the types of loans that their organizations have for small businesses. At a recent Commercial Roundtable Lunch convened by LISC Chicago, lenders described the terms of loans as large as $2.5 million and as small as $500 available to eligible small business owners. But neighborhood commercial district managers who attended the luncheon observed that it’s not just a lack of knowledge about loans that’s slowing business expansion: financial disorganization on the part of small business owners prevents them from securing those loans. Owners who refuse to part with vacant properties in a down market also put a damper on expansion, they said. “Sometimes I think they want to keep the property vacant,” noted Christyn Henson of Quad Communities Development Corporation. Other times they can’t afford to rehab property to attract a suitable tenant, she said. To help small business owners who don’t necessarily quality for bank loans, Accion Chicago will loan up to $50,000 for existing businesses and up to $20,000 for start-ups. Credit-builder loans between $500 and $2,500 are also available. To qualify, Accion's borrowers need to show sufficient cash flow from their businesses or other sources, which can even be their social security checks. Homes and vehicles are accepted as collateral. Quad Community Development Corp.'s Christyn Henson was on hand to hear about the loan products. To qualify for the loan, businesses need to be located in a census tract with a poverty rate of at least 20 percent or that meets certain requirements for median income. “If you think your neighborhood is a relatively low-income community, then it probably qualifies,” said Hamory. Based on federal rules, LISC New Markets can’t loan to tanning salons, liquor stores or other “sin” businesses, she added. Restaurants can sell liquor, but can’t package it to sell. Those kinds of "sin" businesses, however, are welcome to apply for loans from Accion, said Clinton. The ventures it doesn’t lend to, she said, include non-profits, real-estate flipping, marketers with pyramid schemes, and prototype developers. Inventors can qualify for a loan, though, once they have purchase orders, she added. Adult entertainment venues, lenders and exporters are also not eligible. Roger Sosa, left, of Back of the Yards Neighborhood Council, with Abraham Lacy, Far South Community Development Corporation. Farid Muhammed of Garfield Park Community Council and Eduardo Arocho of Division Street Business Development Association in background. Tina James, director of commercial and technology services for Greater Southwest Development Corp., said she worked with a small metal manufacturer who had the annual sales to get a loan from a traditional bank but didn’t have tax returns from all its family members who are part owners in the business. Clinton suggested a number of resources for businesses in that situation. “The Women’s Business Development Center is excellent.” Other institutions that can help include other Small Business Development Centers, such as the Chicagoland Chamber of Commerce, she said. Foreman said that community banks are a good resource for businesses in his neighborhood seeking lines of credit. Some of his top referrals are Marquette Bank and Urban Partnership—formerly ShoreBank. Tina James, of the Greater Southwest Community Development Corporation, said many small businesses need lines of credit rather than straight loans. LISC Chicago’s Commercial Roundtable Lunches are open to neighborhood organizations across the city working on their commercial districts. Learn more about our resources. 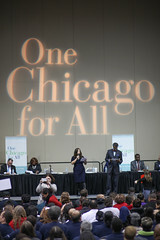 Support for commercial district programming at LISC Chicago is generously provided by the Polk Bros. Foundation and the Goldman Sachs 10,000 Small Businesses Initiative at the City Colleges of Chicago. See locations of Small Business Development Centers in Illinois.